Accurate, crisp shifting makes your drives through Leawood, Shawnee, Prairie Village and Overland Park comfortable and efficient. If your transmission isn’t working as it should, you might find the check engine light coming on. You may feel a slipping, surging or clunking feeling as you drive your car, or it could just stop moving altogether. If you’re experiencing unusual shifts or transmission-related symptoms, you’ll likely need a transmission repair or possibly computer reprogramming of some kind. Some cases may require complete transmission replacement with a high-quality remanufactured unit. Since 1986, New Concept Auto Service has performed precise, reliable transmission repairs in Overland Park. Our staff members are honest and friendly, demonstrating the best customer service while accurately diagnosing and repairing transmissions on most makes and models. At New Concept Auto Service, we have ASE-certified master technicians, two of whom hold the highest level of training, L-1 (advance engine performance). We have the expertise to diagnose and repair transmission concerns, both minor and major, while utilizing cutting-edge technology and tools to ensure it’s done right. 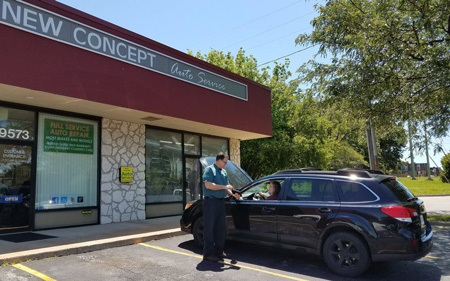 We know you want your transmission repairs to last as long as possible, so we always use original equipment or high-quality aftermarket parts for transmission repairs at New Concept Auto Service. From transmission cooler line replacement on your Ford Explorer, to a complete transmission replacement on your Chevrolet Traverse, we use the best parts for a durable repair. Honest. Accurate. New Concept. Call us or use our online appointment form to schedule your transmission repairs today! At New Concept Auto Service, you can rest assured that an ASE-certified technician is working on your transmission repair. We have the expertise and training to repair any concern that pops up, from fluid leaks to worn out parts. We perform transmission repairs on all domestic and import models, regardless of the vehicle’s age. We have the necessary diagnostic tools and the repair technology to efficiently and accurately perform your transmission repair right the first time.